Cobra is the common name for a number of Asian and African snakes in several genera of the family Elapidae, characterized by smooth scales, large shields covering the head, eyes with round pupils, a pair of short, rigid fangs to inject venom, and the ability to expand their neck area to form a flattened hood. The term cobra is especially associated with the genus Naja, the "true cobras." Although cobras can be dangerous, and thus instill fear in people, deaths from cobras are largely preventable deaths from careless or provoking encounters, where the snake may feel threatened. In general, cobras provide values for both the ecosystem and for humans. Ecologically, cobras are important to food chains, helping to maintain the balance of prey species and controlling agricultural pests such as rats and mice. Humans have used them for meat and skin, and the venom offers hope as a remedy for various diseases. Cobras also add to the wonder of nature for people, and some cobras, such as king cobras, are popular attractions in zoos. Cobras are elapid snakes—members of the Elapidae family. The elapids are a family of venomous snakes found in tropical and subtropical regions around the world, including the Indian Ocean and the Pacific. They are characterized by possessing a set of hollow, fixed fangs through which they inject venom, and come in a wide range of sizes, from only 18 cm (Drysdalia) up to 6 m in length (King cobra, Ophiophagus). Myers et al. (2006a) recognize 46 genera of elapids, while the Integrated Taxonomic Information System (ITIS) lists 61 genera with 231 species. In addition to cobras, the Elapidae includes the taipans, brown snakes, tiger snakes, fierce snakes, coral snakes, mambas, sea snakes, and others. Outwardly, terrestrial elapids look similar to the colubridae: almost all have long and slender bodies with smooth scales, a head that is covered with large shields and not always distinct from the neck, and eyes with round pupils. In addition, their behavior is usually quite active and most are oviparous (egg-laying). There are exceptions to all these generalizations: For example, the death adders (Acanthophis) include short and fat, rough-scaled, very broad-headed, cat-eyed, live-bearing, sluggish ambush predators with partly fragmented head shields. Some elapids are strongly arboreal (African Pseudohaje and Dendroaspis, Australian Hoplocephalus), while many others are more or less specialized burrowers (e.g. Ogmodon, Parapistocalamus, Simoselaps, Toxicocalamus, Vermicella) in either humid or arid environments. Some species have very generalized diets but many taxa have narrow prey preferences and correlated morphological specialisations, such as for feeding on other snakes, elongate burrowing lizards, squamate eggs, mammals, birds, frogs, fish, and so forth. Sea snakes, which are also generally considered elapids, have adapted to a marine way of life in different ways and to various degrees. All have evolved paddle-like tails for swimming and the ability to excrete salt. Most also have laterally compressed bodies, ventral scales are much reduced in size, their nostrils are located dorsally (no internasal scales) and they give birth to live young (ovoviviparous). All elapids have a pair of proteroglyphous fangs that are used to inject venom from glands located towards the rear of the upper jaws. The fangs are the first two teeth on each maxillary bone, which are enlarged and hollow, and usually only one is in place on each side at any time. The maxilla is intermediate in length and mobility between typical colubrids (long, less mobile) and viperids (very short, highly mobile). When the mouth is closed, the fangs fit into grooved slots in the buccal floor; in the longest-fanged elapids (e.g. Acanthophis, Oxyuranus) it is common for the fangs to pierce right through the intermandibular skin, which does not seem to endanger the snake. The fangs are usually below the front edge of the eye and are angled backwards; due to this construction, most elapids must actually bite in order to envenomate. This action is therefore not as quick as with the viperids, that can envenomate with only a quick, stabbing motion. Elapids use their venom both to immobilize their prey and in self-defense. Cobras are characterized by inflatable neck hoods. The hood is the name in anatomy for the flap of skin behind the head of cobras, which can be used to make the snake appear bigger. It involves loose skin that the snake can inflate with air from the lungs, extending the underlying ribs, which are movable. The hood can carry distinctive markings. 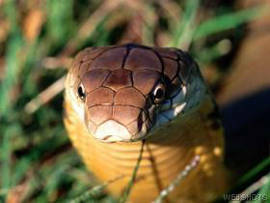 Naja naja, the Indian cobra, has a hood that has eye-like figures on the back. The hood of the Asian cobra is, proportionately, much larger than that of the king cobra and is usually yellow to brown, with a black-and-white spectacle pattern on top and two black and white spots on the lower surface. Cobras generally inhabit tropical and desert regions of Asia and Africa. They typically are nocturnal hunters, that capture small vertebrates—mammals, birds, amphibians, and even other snakes in some cases. All but the rinkhals Hemachatus haemachatus, lay eggs. The ringkals (also known as ringhals or "spitting cobras") are unique among African cobras in being ovoviviparous (Hunter 2000). They give birth to 20-35 young, but as many as 65 babies have been recorded (Mastenbroek 2002). The ringkals are one of a group of cobras that has developed the ability to spit venom as a defense mechanism. The king cobra (Ophiophagus hannah) of Asia is the world's longest venomous snake, growing to a length of 18.5 feet (5.7 meters) (Mehrtens 1987). Myers et al. (2006a) recognize eight genera (of 46 in Elapidae) with the name "cobra" as part of the overall name. These are Asidelaps (shieldnose cobras), Boulengerina (water cobras), Hemachatus (spitting cobras), Naja (cobras), Ogmodon (Fiji cobras), Ophiophagus (king cobra), Pseudohaje (forest cobras), and Walterinnesia (black desert cobras). Myers et al. (2006b) recognize 19 species in the genus Naja. The most common cobra is the Indian cobra or spectacled cobra Naja naja, native to the Indian subcontinent and associated with snake charming there. 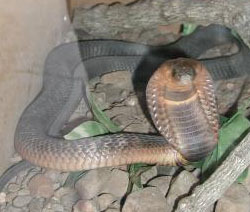 The black cobra, found in Pakistan and North India, is commonly considered to be a sub-species. The second most common cobra species is the Monocled cobra, Naja kaouthia, widespread in Asia. 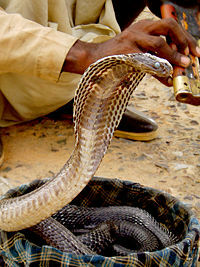 In addition to a deadly bite, the spitting cobra can incapacitate larger would-be predators by delivering venom to their eyes. While extremely irritating, it rarely causes lasting damage if washed out promptly. The king cobra is ophiophagous; It feeds almost entirely on other snakes, even venomous ones, although it sometimes preys on small rodents and birds. The venom of the King Cobra is primarily neurotoxic and the snake is fully capable of killing a human with a single bite (Capula et al. 1989). The mortality rate can be as high as 75 percent, but most bites involve nonfatal amounts of venom (Capula et al. 1989; Mathew and Gera 2000). 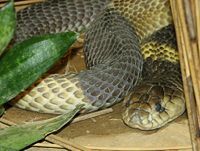 Naja naja, the Indian cobra, is very common and frequently is found in homes in pursuit of rats. As a result, there are a considerable number of people killed each year from its venom. As the snakes are active at night, being nocturnal hunters, many cases result from humans walking unknowingly, often barefoot, where the snake is positioned. However, in general, most people survive cobra bites and encounters with cobras. Cobra bites are fatal in about 10 percent of human cases. Cobras typically will only attack a human if provoked or in other extreme circumstances that threaten its survival. Furthermore, for a dangerously venomous snake, the cobra's strikes are quite slow when compared to the almost literally "faster than the eye can see" strikes of such species as rattlesnakes. In addition, not all bites result in envenomation and in the case of the cobra the amount of "blank" strikes may be quite high: in one series of recorded bites in Malaysia only 55 percent of strikes had been poisonous. However, as with any venomous snake, a bite from a cobra should be treated as a potentially fatal injury and medical attention should be sought immediately. As with all elapids, the venom of cobras is highly neurotoxic and dangerous. Therefore, any cobra bite must be regarded as life-threatening and professional medical assistance should be immediately sought. Early symptoms of a bite include ptosis, diplopia, dysphagia, and dizziness, followed by progressive respiratory muscle weakness, ultimately requiring endotracheal intubation. Cobra venom is a postsynaptic neurotoxin. It works by stopping the acetylcholine molecules in the diaphragm muscle from interacting. Without treatment death, from respiratory failure in very rare occasions may occur as early as 30 minutes after being bitten. Standard treatment involves the use of antivenin. Additionally, it is possible to support bite victims via mechanical ventilation, using equipment of the type generally available at hospitals. Such support should be provided until the venom is metabolized and the victim can breathe unaided. If death occurs, it often takes place approximately 6 to 12 hours after the cobra bite. Cause of death is respiratory failure—suffocation caused by complete paralysis of the diaphragm. Indian snake charmers play a harmless trick on spectators. A cobra rises from its basket and sways in time with the music, apparently hypnotized. In fact, as far as the snake is concerned, the music is irrelevant—the cobra, like all snakes, cannot hear a thing. What prompts it to perform is the snake charmer's clever manipulation of the cobra's natural tendencies. When suddenly thrust into the open air from the darkness of the basket, the snake rises up and spreads its hood, its normal reaction to a threat. Seemingly, it sees the swaying pipe and mistakes it for another snake. That error, together with the charmer's movements in time with the music, holds the snake's attention. As the charmer moves the pipe, so the cobra bobs its head. That is the only way for the snake to follow the pipe's movements, because it cannot swivel its eyes. Capula, M., G. Mazza, and J. L. Behler. 1989. Simon & Schuster's Guide to Reptiles and Amphibians of the World. New York: Simon & Schuster. ISBN 0671690981. Hunter, S. 2000. The natural history and captive care of the Rinkhals spitting cobra. VenomousReptiles.org. Retrieved December 5, 2007. Integrated Taxonomic Information System (ITIS). 2006. Elapidae. ITIS Taxonomic Serial No. 174348. Retrieved December 5, 2007. Mastenbroek, R. 2002. Rinkhals spitting cobra (Hemachatus haemachatus). Kingsnake.com. Retrieved December 5, 2007. Mathew, J. L., and T. Gera. 2000. Ophitoxaemia (venomous snake bite). Priory.com. Retrieved December 5, 2007. Myers, P., R. Espinosa, C. S. Parr, T. Jones, G. S. Hammond, and T. A. Dewey. 2006a. Family Elapidae (cobras, coral snakes, and kraits). Animal Diversity Web (online). Retrieved December 05, 2007. Myers, P., R. Espinosa, C. S. Parr, T. Jones, G. S. Hammond, and T. A. Dewey. 2006b. Genus Naja. Animal Diversity Web (online). Retrieved December 05, 2007.